A great show no doubt, and A HANDMAID’S TALE, a fantastic show. Yet again exhibiting the brilliance and artistry in writing (i.e. novels). Looking forward to next year’s Emmy’s! As I am sure GAME OF THRONES will not leave empty handed. 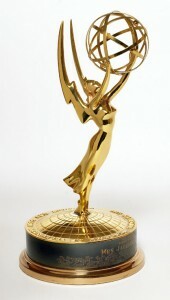 We hope to see you at more Emmy’s in the years to come. Happy Name Day Mr. Martin, and thank you for the continuing art you share with us. Cheers!